Working-class punk like The Explosion with a hint of ska and some classic oozin’ aahs a la Bad Religion. It’s a remarkably polished recording for a gritty punk band, but FFF make it work. Check out “Plague” immediately. Why do people keep going back to artists like The Replacements, Bruce Springsteen, The Beatles, and Billy Bragg when they need to feel something real? Because they just don’t make ’em like they used to. With all the focus on superficiality, the emphasis on hard day-to-day life has been forgotten, or worse, trivialized by kids who never lived it and don’t truly feel the tension. Far From Finished couldn’t hide their honest roots if they tried. 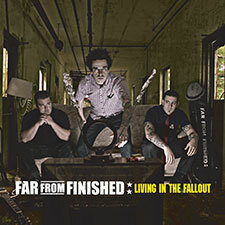 “Living In The Fallout” is one of the few albums of timeless punk rock that will last for years to come. A top contender for this year’s quintessential summer album. Last year’s was without a doubt the Bouncing Souls’ The Gold Record, and Living in the Fallout has all the energy, hooks, and good vibes to match it.